So as Kali has been getting older and getting into school, she has become more self conscious. She has started to care what the other kids think, because naturally she wants to fit in. We have talked a lot about "being yourself" and "doing what you want to do, not what other people want you to do", etc. Well, this week she has been very self conscious about her secret love for Justin Bieber. I have explained to her that if she likes him, she doesn't need to hide it and she shouldn't be embarrassed about her choice of music. She told me that she was still kind of embarrassed. So what did I decide to do? Celebrate being different! We went to the dollar store and got funny glasses, and then drove around in my car BLASTING the Justin Bieber tunes singing at the top of our lungs! It was so fun and I think she finally got the message. DARE TO BE DIFFERENT and BE YOURSELF! Here's some pics of our day! 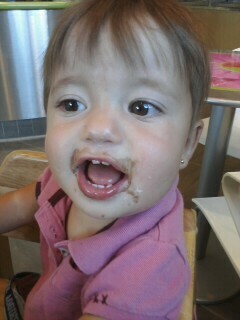 Also....I think I got another little gal to jump onto my "Frozen Yogurt obsession" bandwagon! Newest member: Little Miss Rylie!